Tulips are like no other flowers for spring and are just perfect for decorating. Tulip in a paper bag !! It’s beautiful and eco friendly ! Place the Vase with Tulips in the Window. You can decorate the house for a birthday party with Tulips. Tulips in the doorway are beautiful and welcoming . This vase is from Ikea and it is only $ 5. 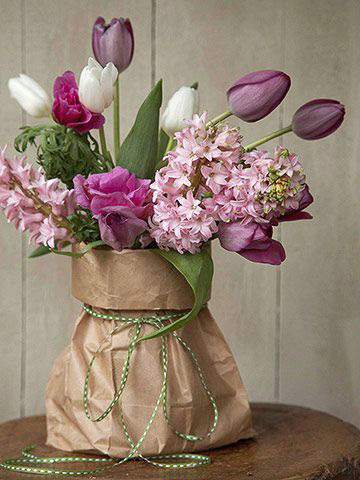 Mix Tulips with other Flowers, use all your Creativity! Stylish! Tulips in Wire Basket have the French Countryside Feel! Wrapped with a Rustic Fabric.